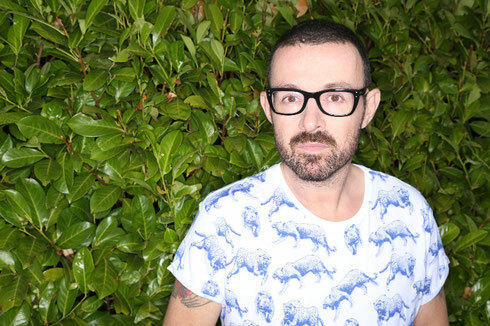 Judge Jules returns to Eden in Ibiza with Judgement Fridays for its 15th season. 2015 has been a year of change for the Judge with a brand new image and a fresh sound that aims to put the Judgement brand at the forefront of the San Antonio nightlife this summer. Pushing a music policy that combines some of the biggest talent in dance music, Judge Jules has hand-picked a team that plans to begin each weekend in style. Over the course of 13 weeks, Judgement Fridays will play host to Alex Kunnari, Ben Hennessy, Blinders, Charlie Hedges, Corrupt, DubVision, D.O.D, EDX, Futuristic Polar Bears, Jamie Duggan, Junior J, Ko Kane, Mr Belt & Wezol, Nick The Kid, Sick Individuals, Thomas Newson, Third Party, Tom Zanetti and Judge Jules himself. 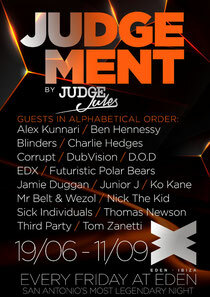 Judgement Fridays will be at Eden every Friday from 19 June and 11 September.